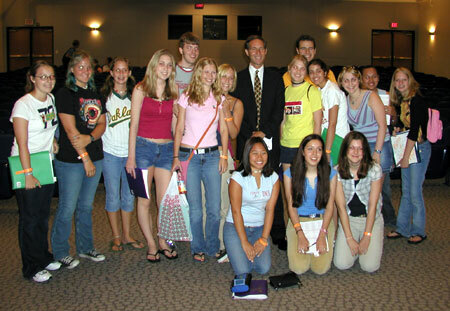 CNN correspondent Gary Tuchman poses for a picture with the students from Kline High School after sharing some of his stories and words of advice. Flying with the United States Air Force on a mission over Iraq during Operation Iraqi Freedom; standing at Ground Zero the morning after Sept. 11; talking with a daughter of Fidel Castro or the royal family. These are the kinds of things CNN correspondent Gary Tuchman has done. Tuchman shared some of his favorite stories and gave advice to high school students from across the state, also giving them a glimpse of what it's like to be a national correspondent, Tuesday morning in the Sam Houston State University Lowman Student Center Theater. The speaker was part of Taylor Publishing Company's 2003 Sam Houston Communications Workshop. "I want to tell you that when it comes to journalism, the key thing to remember is that you are a storyteller," Tuchman said. "People laugh when you say that but that's really what you're doing-you're telling stories." Tuchman has had plenty of opportunities to be the storyteller. Before starting at CNN in 1990, he worked for a television station in Maryland, becoming anchorman before moving to West Palm Beach, Fla.
"As part of my going to West Palm Beach I had to do a lot of traveling to foreign countries for the stories," he said. "That was in the 1980s, and the big story back then was the drug wars. I did a lot of traveling to Latin America." While in Florida, Tuchman's series on the Intifada from the Gaza Strip and West Bank received an Emmy Award nomination and some attention from CNN. "CNN saw some of the stories I had written, and they hired me in 1990," he said. "I worked in New York City for the first 10 years. Then they transferred me to our headquarters in Atlanta three years ago." Since working at CNN, Tuchman has covered a variety of different topics, from the Chandra Levy case to the Sammy Sosa corked bat incident. One of the most compelling stories Tuchman did was also one of the most recent ones, involving being embedded with the United States Air force during Operation Iraqi Freedom, he said. "What the Pentagon allowed journalists to do this time, for the first time in the history of this great nation, was to allow journalists to be embedded with the troops," he said. "They allowed journalists to live and work with the troops during the war as long as we were willing to sign away our life on a piece of paper saying that if anything happens to us we can't sue them." While staying with the Air Force at an air base in Kuwait, Tuchman's job was to cover the missions and fly along with the soldiers. One day, while the troops were waiting for a helicopter to refuel two 'blips' were spotted on a radar. "This was at the beginning of the war, so they don't know what's going to happen. The blips were another aircraft, but they didn't know if it was an American aircraft or an Iraqi aircraft," he said. "But you can't call out over the open air and say, 'Who are you?' because if it's the enemy, they hear you and shoot you." In order to determine whether the 'blips' were following them, the pilots began making 360-degree circles in the air. "I kept looking at the pilots' faces to see if they would reassure me, and they didn't reassure me," he said. "After they did a few more 360 degree loops, the blips disappeared, and to this moment, to this day, I still don't know what those blips were. If they were another plane, we don't know who it was." Tuchman said the event put the war into perspective for him. "That's what war is all about. That's what these guys deal with," he said. "I greatly admire their courage; they're very courageous. We put our lives in their hands when we travel with them, and that's part of what happened." Journalism is more than just covering sad or mysterious events. Tuchman said one of the funniest stories he has involves a press conference about 10 years ago.
" One of the things we do is we have big news conferences where we go live and introduce the news conference. Sometimes we have to 'tap dance', which is talking until the conference starts," he said. "Ten years ago, Fidel Castro, the dictator of Cuba, his daughter defected the United States, and she defected to a location in Columbus, Ga. She was having a news conference there, with the news conference starting at noon sharp. "I got there and they tell me, 'OK, Gary, you're going to give a live report at 12 noon, and if the news conference has already started we're just going to go right to the news conference live from CNN, and if not, tap dance until it starts'," he said. Thirty seconds before the conference was scheduled to begin he began introducing her, expecting her to come out. When she didn't, he began giving general information about the daughter and why she left Cuba. "Now it's like seven minutes (of 'tap dancing')," he said. "The anchor says, 'Gary, keep going because we're afraid that if you toss it back to me and we go to commercial the news cast will start and we'll miss it, and this is a big story." So he gave more general information about Castro and Cuba. "I'm talking and talking, and the thing's not starting. Now it's 20 minutes, and I'm running out of things to say," he said. "Finally, we give up, and I throw back to the anchor; we go a commercial. And sure enough, the second the commercial starts, she comes out, they start the press conference, and we miss the beginning of it. I was really upset. "After the news conference is over, I asked her, 'How come you didn't start it like you told me? It created a hardship for us'," Tuchman said. "She (Castro's daughter) goes, 'Oh, Gary, we were in the back of the room watching CNN, and we didn't want to interrupt you. So when you went to a commercial, we came out.' We learned a lesson from that. We now tell people to start the press conference whenever they're ready." Tuchman said those kinds of stories give the students an idea of the variety in journalism. "There's always something different to learn about," he said. "People go into journalism because it's something they're interested in. Twenty-one years after I've gotten out of college, I still find this as fun as when I first started. "It's a great way to make a living because you always have people paying attention to what you do, whether you're a writer or working on the radio or are on TV," he continued. "People learn something from you, and you're always learning about different topics. You always have a sense of fulfillment and you may not realize it now, but as you get older, you need that sense of fulfillment." Tuchman advised the students to major in something they are interested in while in college, not just something that is 'practical' or something their parents want them to do. "That's how you do well in school, when you study what you're interested in, and that's how you do well in your post-school life, by working in what you're interested in," he said. "Don't do what's practical. Do what's in your heart. Follow your dreams. It may sound clich�, but I know too many people who I went to college with who kind of did what their parents wanted them to do and weren't happy doing it." 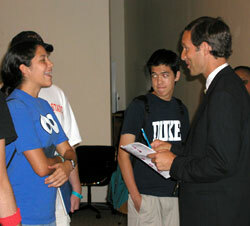 He also suggested that students learn a foreign language and get plenty of practical experience while in college. "Bosses don't just want you to be someone who gets all A's; they want you to have some practical experience too," Tuchman said. "I went to college and majored in journalism. As soon as you get to college, radio stations and newspapers and TV stations want interns. They want people who will work for free, and you've got to be willing to do that because if someone is going to hire you down the road, they want to make sure you know what you're doing. So you need to do that in addition to doing well in school." And to the future journalism majors in the group, Tuchman stressed the importance of always being polite. "I think a lot of people stereotype journalists as being rude and being aggressive. And, yes, when you have to get a story, sometimes you have to be aggressive, but there's no reason ever to be rude," he said. "Even when I have to deal with the most unscrupulous, loathsome characters, I'm still polite because you don't get what you want when you're being rude. That's a really important thing to keep in mind." He also told the students that just because you are covering a story doesn't mean you can't be compassionate. "You are a journalist second and a human being first," he said. Because of the arrest made in the missing Baylor basketball player Patrick Dennehey's case, Tuchman was only able to speak in the morning before leaving en route to Waco.